Like our Southeast Asian neighbors, the Philippines is known for its water festivals. Some are wet and wild, others are solemn religious fluvial processions, others are both. 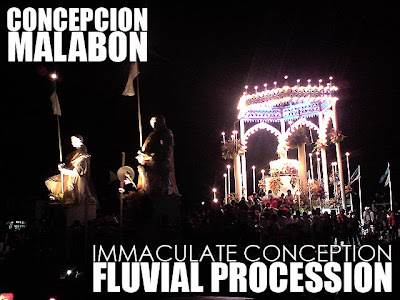 I was invited to witness the fluvial procession in Concepcion, Malabon last December 9. Why December 9? The Concepcion, Malabon fiesta actually lasts three days from December 8 to 10. December 8 is the Feast of the Immaculate Conception nationwide. Aside from the fact that they did not want to compete with the significance of the nationwide commemoration, December 9 is the Pista ng mga Mangingisda (Fishermen's Festival). That's why the fluvial procession is held on that day. 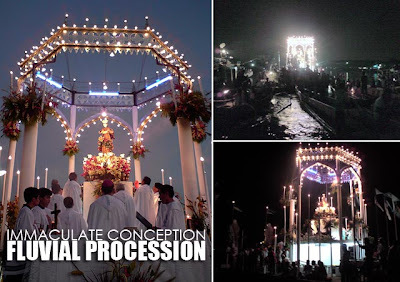 December 10 is the Pista ng Parokya ng Concepcion (Feast of the Concepcion Parish) when a grand procession of the image of the Immaculate Concepcion is held. I'm used to the day time fluvial processions. The one in Concepcion in contrast, left at sunset. The pagoda that bears the image of the Immaculate Concepcion is constructed on top of two cascoes (traditional trading boats dating back to the Spanish colonial period that are fast disappearing) and elegantly lit with blue and white lights. From the Rufina Patis factory in Concepcion, it goes as far as the mouth of the river close to Manila Bay, then back all the way to the San Bartolome Church, before finally making its way back to Concepcion. Despite the water pollution, the slow and solemn movement of the procession and the elegant lights make the trip an enchanting one. Through the years, some traditions disappeared. They used to stopover in Navotas (said to be the original home of the image) to sing praises which made the procession last until the wee hours of the morning. But when Martial Law was imposed, together with curfews, this practice was stopped. The pagoda also used to go as far as Manila Bay as well where boats participating in the procession would honor and salute the image by circling the pagoda. But after the Bocaue tragedy, the Philippine Coast Guard became very strict. And that practice was stopped as well. After the procession, we feasted on a sumptuous dinner prepared by the Lucas Family that owns Rufina. Pardon the quality of the photos. It was a spur of the moment trip and I only had my camera phone with me. Greetings from Hit A Bargain! Just wondering if you or your readers would be interested to join LIGHTHOUSE MARINA Resort's FREEBIE promo worth P50,000 of luxury pamper package, just by blogging about it. Please check Hit A Bargain! site : www.hitabargain.com for more details.